South Africa could be facing another serious stint of mining strikes after the industry’s main union rejected the final pay offer made by the Chamber of Mines. The National Union of Mineworkers (NUM) in the gold sector has announced that it will begin strikes from Tuesday’s night shift. “The night shift is dependent on the mine, but it generally starts between 4pm and 6pm in the afternoon. Those members expected to report for duty then will not do so,” NUM Spokesman Lesiba Seshoka said. Employers in the gold mining industry were issued with a strike notice by NUM on Friday. NUM claims to represent at least 80,000 workers in the industry. 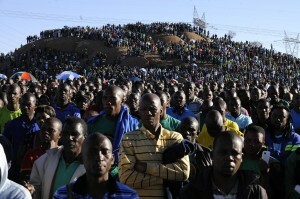 South African President Jacob Zuma on Tuesday urged both mining companies and the workers to avoid an imminent strike. “A strike hurts both sides. They must find a solution,” President Zuma said in Pretoria. Gold mining companies, AngloGold Ashanti, Gold Fields, Rand Uranium, Harmony Gold, Evander Gold, Sibanye Gold, and Village Main Reef, offered a basic increase of 6.5 per cent for category four and five employees, including rock drill operators. Mining bosses have warned that wage increase could lead to job cuts. “Promoting expectations above the capacity of the industry to pay is a dangerous road that may have tragic consequences for employees who do not understand how close we are to economic devastation in certain sectors,” wrote Mark Cutifani Chief Executive of mining giant Anglo American in South African daily Business Day. The union is demanding R7000 a month for surface workers and R8000 a month for underground workers. Charmane Russell, Spokeswoman for the gold producers, had said the employers wanted to avoid industrial action. “Negotiations and discussion have continued and will continue. Not reaching a settlement is not an option for the industry,” she said. At this stage, talks of a lock-out were just rumours but the possibility remained, said Russell. Meanwhile, Trade union Solidarity, which claims to represent close to 10,000 workers in the industry, has asked the chamber for more time to consult its members about the new wage offer. “So far, it seems we have 40 per cent support for the strike and 60 per cent against it,” General Secretary Gideon du Plessis said on Monday. Solidarity was waiting to see if employers locked workers out in response to the NUM’s strike. “This will automatically mean that no services will be rendered and the mine will start flooding,” Du Plessis said. Wildcat strikes in South African mines last year had resulted in losses of billions of dollars for Africa’s biggest economy. According to a Reuters report, South Africa’s gold industry, which once accounted for almost 80 per cent of global bullion output, now produces just six per cent of the world total.